Brooklyn, NY - It looks like a supermarket, but it really is a preschool — even if the city doesn’t see it that way. Yeshiva Ketanah of Torah Vodaath’s preschool center has been operating on Quentin Road between East 31st and 32nd Streets since 2008 — despite the fact that the city has twice rejected its application to open. But school leaders say they haven’t done anything wrong. The building is zoned for a store, and it still looks like one. 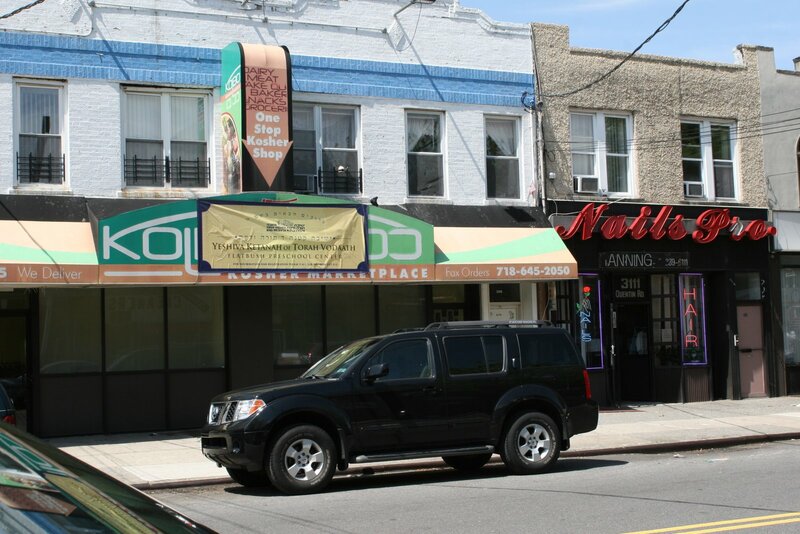 The blue and red awning and large signage for the building’s previous tenant, Kolbo Kosher Marketplace, still hangs — while a vinyl sign proclaiming the school’s existence can’t come close to covering it up. The city says a school would be permitted at the site with the proper certificate of occupancy, but it can’t give one out until the school clears ip the 26 objections the has to the school’s application — including a failure to enclose the cellar stairs or provide details about the layout of the building’s interior, Sullivan said. Gottdiener said that the yeshiva has addressed the objections, but the school couldn’t submit a new certificate of occupancy until it sorted out other paperwork, namely assuring that emergency exits are in place in both sections of the building. Residents say the school should get it’s act together. “If they don’t have a certificate of occupancy for a school, then I think somebody should call 311 or the Department of Buildings to have an inspector come down and verify this,” said Community Board 18 Chair Saul Needle. 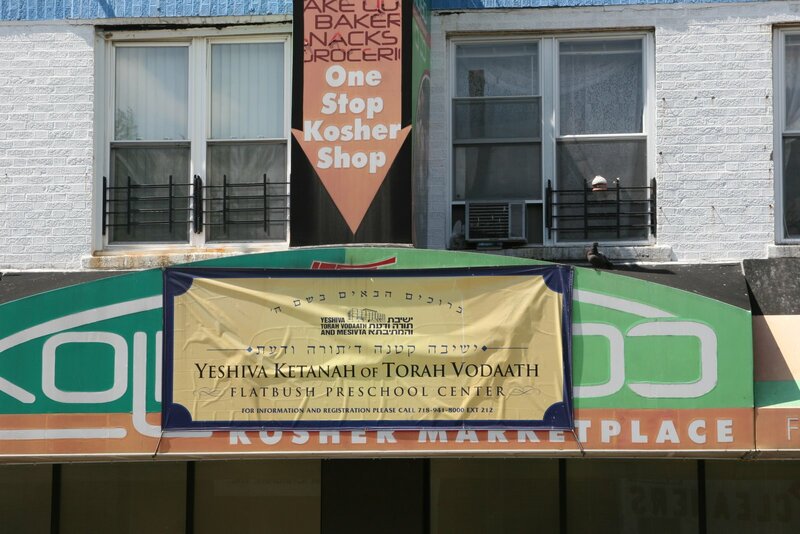 But Gottdiener contends that his supermarket yeshiva, with opaque windows, is a boon to the community. Yeshiva Ketanah of Torah Vodaath has two other locations — 425 and 452 East Ninth Street — offering preschool to high school grades. What is daas torah on this? Should we the laymen come out with a kol koreh banning illeagal activity to benifit a shul or a cheder that daas torah won't ban? Sorry to dissapoint but I, a frum New Yorker, agree with the City. NYC does not have a racist agenda, they require a CO. If it takes time then don't start the school till then. I also was not permitted to drive till I got a license even though it took time. It actually sounds like not all issues have been adressed. safety counts. Funny how it's in th news today. I passed it yesterday and could not make out if it's a grocery or yeshiva. The last I would think of is That's it's for pre school looked very unappetizing especially with the bar a few doors down. "Gottdiener said that the yeshiva has addressed the objections, but the school couldn’t submit a new certificate of occupancy until it sorted out other paperwork, namely assuring that emergency exits are in place in both sections of the building. " This isn't some technical bureauocratic mumbo jumbo, but actual safety issues. If you had a kid in the school, would you feel safe, knowing there aren't proper emergency exits if c"v there was a fire? Is it going to take someone r"l to be killed before the "heimishe" world wakes up and realizes that building codes are there for a reason, and not just for fun sake? Forget the chilul hashem that this causes, and forget the "mishum aivah" issues, these are real life and death issues. Dina d'Malchusa Dina - applies to Mosdos too. The requirement for a C of O is in the area of building safety, some thing that a Mosad with small children absolutely must comform to. If Rav Pam zt"l were alive - what would he say ?? To quote "“The certificate of occupancy can sometimes take years until you get it,” said Rabbi Isaac Gottdiener, the yeshiva’s executive director. “So what do you do? You wait? There are many places and schools that operate as long as the safety requirements are met.”" YES YOU WAIT! I am a Kensington girl born & raised & grew up with YTV but you can't just decide what will & won't be adhered to. Also you cant justify bad behavior by pointing out other bad behavior. Just because others do it still makes it wrong. Any parent that sends their children to a school that is not deemed safe in anyway is negligent!!! I see no one from Torah Vadaath went to the Agudah's seminar on business ethics and dina d'malchsa dina. What would Rav Pam, zt"l, say? “The certificate of occupancy can sometimes take years until you get it,” said Rabbi Isaac Gottdiener, the yeshiva’s executive director. “So what do you do? You wait?" A get can take years. Conversion can take years. Earning simcha can take years before you can call yourself a Rabbi. So what do you do? You wait? At least the City enforces it's zoning laws unlike our esteemed Supervisor in the Town of Ramapo. If anyone has ever tried to get a C of O from the Department of Buildings, you know that it can take years. There is so much bureaucratic red tape involved, it takes years to finally get any answer from the city. This is especially true in regards to changing a buildings Certificate of Occupancy. The building in question, has a certificate of occupancy, it just needs to be updated. Before everyone's mouths go off faster then a AK-47 at an Iraqi wedding, Know the facts. #1 Community Board 18 has made it known that Jews are not welcome in the district. Were not talking about a place like Williamsburg that is "in your face Jewish" Were talking about Marine Park where Jews are Quiet and respectful of one another. #2 I have walked past that building many times, its a beautiful building that seems, very "school like"
#3 Your Nabe.com is a division of the Kings Courier. I encourage anyone who wants to visit the website and see the filth they spread. 4 out of 10 articles on their website is about Jews, and all the articles about Jews are derogatory and down right Anti-semetic. You be the Judge. Yeshivah Violating the law, or a over zealous newspaper begging for an article. I've operated several businesses in NYC and while the rules are complex, we followed the rules. This guy is another case of an arrogant yid who thinks the good work he is doing warrants circumventing the law. They should shut this facility down and keep it closed until he gets the required paperwork filed and approved. Every day there is another story about yidden trying to sneak around or flout the law. Enough already. You make the point clearly and succinctly. If orthodox jews behave like this and publicly thumb their nose at the secular laws (which for a yeshiva or ANY yiddeshe institution should be accorded the SAME respect as halacha) we should expect the judicial system to show no compassion for yidden convicted of crimes. The two are linked in the minds of the judicial system. At first I thought it must have been a coincidence that VIN seems to carry two or three stories every week about another yiddeshe institution violating building codes, zoning laws or seeking special exceptions (sometimes after the fact). Its become a pervasive problem which the rabbonim seem to be the worst offendors. Before you call someone arrogant, get the facts. The reporter who wrote this article does not have all of the facts and neither do you. Just one point with respect to the issue raised with the exit was rectified prior to the Yeshiva moving in but due to red tape the paperwork submitted still awaits a sign off. All of you who think YTV is putting people on danger are making a mistake and certainaly do not attack a wonderful erlich yid like Rabbi Gottdiener. For those of you bringing Rav Pam into the mix, I imagine he is not particularly fond of the use of his name on a blog. Let's keep our gedolim off the blogs. They deserve better. And what happens until you get the C of O, home school? Fledgling schools have held classes in home kitchens and dining rooms for centuries. “ If anyone has ever tried to get a C of O from the Department of Buildings, you know that it can take years. There is so much bureaucratic red tape involved, it takes years to finally get any answer from the city. This is especially true in regards to changing a buildings Certificate of Occupancy. The building in question, has a certificate of occupancy, it just needs to be updated. "The building in question, has a certificate of occupancy, it just needs to be updated"
Gee thanks, It has a C/O for a SUPERMARKET, and they have a school in there. Supermarkets have BIG AISLES and NO WALLS, and DONT HAVE 200 KIDS UNDER THE AGE OF 6 INSIDE. Did you ever consider that it's a street with businesses and zoned for business. Putting a school there will take up parking spots and having hundreds of kids walking in and out will adversely affect the local businesses that require easy accessibility for their customers. I for one would not want school buses and double parked cars outside my store, making it difficult for my customers to enter and exit and bring merchandise to their cars.Aren't we supposed to have consideration for others and set an example for others? If the city oks it then fine. Until then, abide by the law! #13 - Every living human who knew Rav Pam knows without a shaddow of a doubt that were the Rosh Yeshiva alive today this would not be happening. The law is the law period. Why isn't everyone breathing fire down George (Gedalya) Weinbergers back that as the President of the Yeshiva he stop this immediately. Mr. weinberger is on the board of the Aguda and Torah Umesora and other organizations and all of them should be putting pressure on him to follow the law. 1 - Jews in Williamsburg are also quiet and respectful! 2 - I live there. It is NOT a beautiful building, nor school like and it is near a bar, across from a funural home and looks like a run down business that has been closed for a while. A synagogue in my neighborhood was completing some major rennovations last fall. They were regularly in touch with the Department of Buildings throughout the process and received a C of O at 5:15pm erev Rosh HaShanah, just hours after the rennovations were completed. I think it is safe to assume that if there were a real safety issue the City or the State would immediately shut it down. Schools and Day Care centers after all require licensing and annual inspection by the Department of Health among others. The fact that they have not shut it down indicates that while there may be issues requiring remedy and rectification to be in full compliance with every nuance of building code, they are still in suitable enough shape to operate safely. Nobody, no business,no school, or organization, is perfect and no one should be held to a standard of perfection. If we required everything in our society to be perfect, nothing would ever get done or be accomplished. Anyone who has ever run a business or especially someone who has started a business knows that you can not get things right 100% of the time. Even Neurosurgeons can not get things right 100% of the time. The standard should be what it is "Reasonable" and "Sensible". I have heard that the interior space is a beautifully and appropiately outfitted space for a preschool. The city's rules are complex but still necessary for life safety. I opersonally obtained certificate of occupancies for multiple schools and the city will go out of their way to accomaodate any educational facility if you show willingness and that you are working on the issues. Unfortunately I have seen a lot of times where safety has been jeapordized as well and the city is not "whol' d a hell crazy"
Torah Vodaath is the one of the last and possibly the last Yeshiva that is a community institution and not a privately held business. The sole purpose of the Yeshiva is to educate children and they actually accept children even if their parents can not pay full tuition, and they give meaningful discounts to the indigent, unlike other yeshivas and Girls Schools in our community. The tzibbur should see this article as a motivation to donate money to this worthy institution. The sign outside is no good? how about stepping to the plate and donating some money to the Yeshiva so they can afford a good sign. How about donating lots of money to this school so many more yiddishe kinder can get scholorships and attend yeshiva without bankrupting their parents.Here you know your money is really going to Tzadaka and Torah and not to enrich a private school owner or "Rosh Hayeshiva". dear fellow commentators ,what happened to you ???? you assume guilt,danger,cherem,... based on an unknown neighborhood rag, at the very worst " assume that the bldng needs a touch or two"
( p.s. it reminds me of once accompanying rav pam z"tl to Rikers island & 2 inmates had complained &asked; the rosh yeshiva to speak to the chief warden ..rav pam listened to their story,VERIFIED the real current facts with the deputy , & made his decision ( the rosh's level of kavod habrios for a criminal was "ain leshaer" WE SHOULD AT LEAST GIVE THAT LEVEL OF ZECHUS TO klal yisroels "GEMS"
The only reason this issue made press was because it is a Yeshiva, YTV has done so much for all of us, we should all stand up for our school and let our voices be heard in the City Council. Not being in sufficient compliance with with all the requirements neccesary in order update a C of O does not make something illegal. The rush to judgment, and the besmirching of hardworking people who are Moser Nefesh for the community is reprehensible. Everybody take a step back a minute and take a breath. Do you for one minute really think that if someone is not in compliance with every single rule and regulation promulgated by every single goverment beauracracy that you are a lawbreaker. Lets take one example. A few years ago the NYC health department required cold food to be stored below 45 degrees. They then decided to be more machmir and lower it to 41 degrees. Would you call some who stores cold food today at say 44 degrees, a lawbreaker? Do you think that is a fair and reasonable characterization? So lets not blow things out of proportion. Or how about if you let your car inspection or registration lapse. True you would be subject to a fine, but it does not rise to the level of criminality and should in no way be compared to those who willfully flout and break the law. 1- although the sign still indicates a supermarket the yeshiva thought it wiser to spend its money to redo the interior, which is modern clean and run in the most professional manner. All valid points and good ideas but even if it is a community school and not a business, it should abide by all the laws and regulations of the City. Those laws are for the common good. BTW, as a center of chinuch this is a great way to educate the kids. He does not cover that neighborhood, why should he? “ dear fellow commentators ,what happened to you ???? Shmiel, we need more mentchen like you in klal yisroel. a true nachas. When you encounter resistance due to antisemitism, it would be wise to not give them any excuses to shut you down. So yes you do wait and make sure you have a C of O. If all your paperwork is in order then the antisemites will not have excuses. Yes, laws change and if you don't comply you are breaking the law. YTV is usually a quiet middle of the road school, in the manner R. Pam was. His exemplary Middot and Truthfulness was well known and documented. If alive today, this would NEVER happen. How dare this 'rabbi' say.. "“The certificate of occupancy can sometimes take years until you get it,” said Rabbi Isaac Gottdiener...What an idiot and a complete mockery of the institution and the great Gadol who ran it. It is an embarrassment for this school in particular and real jews everywhere when an institution (the real name for this joke of a school) which is called .. Yeshiva TORAH Vodaas'.. This joke of a 'rabbi' does not represent 'torah' at least not R. Pam's ZT'L version of it. Why is that 'jews' think there is so much anti - semitism, and 'they don't know where it comes from', when they constantly break and disobey Laws - mind you Laws which are non discriminatory and are for everyone's protection? When the Broken Elevator story happened, ('jews' and) people where outraged that the city did not do more or have more safety procedures in place. Is it all fine and good to disobey Safety Laws which are for your own protection, until there is a tragedy (Elevators, Bus emergencies)? so you ignore chumras like tiny bugs on leaves and in water? Regulations and Laws are not the same thing. Often times there are contradictions between the regulations and requirements of one govt. agency and another. As I said previously, the fact that the Departments of Health of both the city and state have signed off on it, indicates that the yeshiva is in sufficient compliance with the law to allow a school to operate safely and legally on the premesis. The need to meet whatever other requirements are necceasary in order to comply with DOB regs to update a C of O should not be construed and misrepresented as illegality. Another example, a restaurant has non critical food safety violations such as workers not covering their hair with a hair net. The health department will not shut it down unless it is a critical safety violation that is an imminent danger to public health. Or a building site is found to have violations. The DOB will not issue a stop work order unless it is an imminent danger. The law allows for leeway to make corrections in these kinds of matters. Now if this was Communist China it might be a different matter. They might execute you for something like this. Baruch Hashem we live in a normal country. Actually according to American Law (not your made up law) compliance does equal illegal activity, esp. with warnings and knowledge that a dangerous environment exists on you premises. That’s how the Gov and fine and close you down. Get an exectuvie director in the yeshiva who follows the rules and can bring the yeshiva into the black HA! If the yeshiva knew that what they are doing is kosher, they would have removed the supermarket sign a long time ago. They are hididng behind the sign. i thought schools are prohibited within 1500 feet" as the crow flies"
for all those trying to spread motzi shem ra please go somewhere else. Torah Vodaath is a mosad with a 91 year old PERFECT record. This yeshiva is not out to make money unlike some others, they dont charge full tuition if parents can't afford, they need money, they have done so much for the klal, and how dear people try spreading bad rumors about such a choshuve yeshiva????? If the city hasn't shut them down, obviously it is in great shape for a school, just can have a couple things done to help make it better. But to say it is unsafe is UNTRUE. There are not 200 students there as a previous poster said. there are under 50 students in that branch. I was there and it is perfectly safe and beautiful for a school. and EVERY parent who sends to this branch was there and KNOWS it is safe, so whoever said that it's unsafe is just trying to make trouble for a wonderful mosad and the wonderful man who runs the yeshiva. IT IS PERFECTLY SAFE!! Shkoyach shmiel! you are absolutely right. Rabbi Gottdiener is an ehrliche yid, and obviously you guys dont know him.at least be dan lekaf zechus for fellow yidden instead of automatically assume the worst! This is one of those situations where the big Govt. gets in the way of progress. The program is safe and well-run. But if a CofO is not issued, many fines can be slapped onto the program. So the Govt. drags its feet in the hopes it is defied, and it can collect on fines and fees. Arbitrary rules that govern building code have gone out of control. Small business and non for profits are held in a Govt. vice. I have had the opportunity to see the program for myself. It is absolutely safe. I believe there are under 45 kids at that branch. My son was in the preschool program there last year. It is a great program. It is safe, educational and has great morahs. My son loved his time there. I also believe there were under 50 kids in the program. I have seen it many times. It is spacious, state of the art. and immaculate. I am surprised by this story, but I DON'T regret sending my son there. wow. i haven't read all these comments. i would like to add my two cents, however. 1) there are two classes of kids in there. at most, 50 kids. i suspect they are fewer than that. so no hundreds of kids. dismissal is a pain, people double park, and the bus does too. this is on a two-way street with no traffic light at the corners, so pedestrians with strollers have an especially hard time crossing those corners at dismissal. 2) speaking as someone who had her kid in that particular location of that particular school, i'm surprised to hear about the c/o or lack thereof. one reason i sent my kid there was that i was certain it was fully licensed and legal. no parent asks, "say, do you have a current certificate of occupancy for that particular building?" at the kindergarten interview. don't be so hard on the parents, folks. there's only so much research you can do. i figured they saved money on the sign. i'd rather see a cheap sign and the teachers paid in full, on time. as for the legality of the whole thing, i don't know the story. were my kid still there i would definitely call the school and ask about this now that i've read the story. “ "The building in question, has a certificate of occupancy, it just needs to be updated"
Geez - some pople on hare are so misinformed. There are maybe 50 kids in this builidng - not 200. And most supermarkets in our area do not have big aisles. What a joke these posts are! I can't belive people are giving any credence to this article or the people on here that think they know all - "dina d'malchusa dina" is not the answer to everything. “ Did you ever consider that it's a street with businesses and zoned for business. Putting a school there will take up parking spots and having hundreds of kids walking in and out will adversely affect the local businesses that require easy accessibility for their customers. I for one would not want school buses and double parked cars outside my store, making it difficult for my customers to enter and exit and bring merchandise to their cars.Aren't we supposed to have consideration for others and set an example for others? Obviously, most people commenting here have no idea what this building is about. It's a preschool with two classes - the buses come twice a day and they are two small yellow busses - no parking spaces are taken up - they are there for five minutes a day. C'mon people - don't jump to conclusions before you know the facts. “ All valid points and good ideas but even if it is a community school and not a business, it should abide by all the laws and regulations of the City. Those laws are for the common good. This is just plain ridiculous. Have you ever forgot to put a quarter in the meter? or let the meter expire? Well you broke the law. What a chilul hashem! How dare you? Dina DMachuta Dina. Obviously, there are laws that are sometimes broken that have no meaningful effect. A CofO in this case does not have any bearing on the safety and security of the children at the school. otherwise, as another poster correctly stated, the school would not be open. How many people move into a house without the Cof O until the paperwork can be processed? Or until it is changed from a one to two family house? The facts are similar here and this story is really a non-starter. “ YTV is usually a quiet middle of the road school, in the manner R. Pam was. His exemplary Middot and Truthfulness was well known and documented. If alive today, this would NEVER happen. How dare this 'rabbi' say.. "“The certificate of occupancy can sometimes take years until you get it,” said Rabbi Isaac Gottdiener...What an idiot and a complete mockery of the institution and the great Gadol who ran it. What does a CofO have to do with safety? Please explain! How does the state of the school's sign have any bearing on the safety of the school located within? Did you ever think for a second that it costs a lot of money to open up a school? I'd rather see a cheap sign and a good school then nice premises that mislead the parents into thinking it's a good school (which is what many yeshivos do, spending millions simply upgrading the looks of the school). Torah Vodaas does not care about looks, the look of their Kensington building has stayed the same for 40 years. Think before you speak!